When a person moves closer towards death, he may experience a surge of energy as he gets nearer. He may talk to loved ones, or ask for food after days of no appetite. This surge of energy may be unnoticed, but it is usually a dying person’s final physical expression before moving on. The main fear of death in most cases is due to a fear of the unknown. On Sunday, my beloved father passed away. He was 77-years-old. And before he died, he had this surge of energy, witnessed by me and my cousins. No matter how much you prepare for this moment, death arrives in its own time, and in its own way. Then a dilemma arose, and it was one I was not prepared for. We had to decide whether to have the doctor remove the pacemaker from his chest. A pacemaker is a small device inserted in the chest or abdomen to help control abnormal heart rhythms. This device uses electrical pulses to prompt the heart to beat at a normal rate. When the doctor pronounced him dead, the doctor and the nurse asked if I wanted them to take his pacemaker out. I was still in a state of shock from his death, but had to suddenly decide if I want the doctor to cut my father open and pull out the pacemaker. I called my sister in the US and told her the sad news, and also asked if I should have the pacemaker removed from his body. She did not know the answer. Abhisit and his wife prostrated before the portrait of Thai King Bhumibol Adulyadej. It is the last day of the year and no one will be more glad to see the back of 2012 than Abhisit Vejjajiva, the former Thai prime minister and current leader of the opposition. Last month, a committee appointed by the defence minister declared that the former PM had forged documents to avoid military conscription. As a result, the government is seeking to strip him of the rank he was given when teaching at an army academy and wants to make him to repay his salary. Worse followed at the start of this month when Abhisit was charged with murder over the death of a taxi driver shot by troops during the Red Shirt protests in Bangkok in May 2010. Abhisit was prime minister at that time and he authorised the military to use lethal force, if necessary, to disperse the demonstrators. More than 90 people were killed, and after a lengthy investigation, Abhisit and his former deputy, Suthep Thaugsuban, have been charged with “giving orders that led to the deaths of others with intent”. In addition, the ruling Pheu Thai government has asked the Department of Special Investigation to check into alleged irregularities in the sale of rice when Abhisit was prime minister. It appears that some officials, with or without his knowledge, may have violated the law against price collusion in the sale of rice and that this led to unfair competition in the bidding process. As well, Abhisit and Suthep face allegations that they broke Thailand’s Political Party Act when they made flood compensation donations during their term in office. As if all this were not enough, Abhisit’s Democrat Party is in disarray over who to choose as its candidate for the coming gubernatorial election in Bangkok. The current city governor, Sukhumbhand Paribatra, is a Democrat and is keen to run again for a second term, but Abhisit and other party leaders regard him as far too wishy-washy and want to replace him. They have sounded out the party’s No 2, Korn Chatikavanij, but he has spurned the call because his goal is to take over the No 1 slot and hopefully become the next premier. Thailand and Cambodia launched the first direct bus services linking Bangkok with Siem Reap and Phnom Penh during the week end. BANGKOK- First bus services between the two Kingdoms of Cambodia and Thailand had their debut on December 29, said the Transport Co., a Thai state enterprise under the Transport Ministry. The service includes the Bangkok-Siem Reap route, a 424-kilometre trip that takes about seven hours. The two countries will provide two trips a day. The fare will be 750 baht or US$25. The Bangkok-Phnom Penh service, covering 719 km and taking 11 hours, will run once a day with a fare of 900 baht or $30. Air-conditioned buses will serve both routes, which will run through Aranyaprathet district in Sa Kaeo province. Transport Co works in cooperation with Cambodian bus company Natthakarn Co. Both companies have large ambitions to boost connectivity between both countries. Transport Co plans to eventually provide as many as 20 trips a day on both routes if needed to meet the rising demand of travellers. The new bus routes will help accommodate an expected upturn in travel when the Asean Economic Community is launched in early 2016. ម្នាលភ្នែកមួយសារភាពថា ខ្លួនគ្មាន​សមត្ថ​ភាពរកប្រាក់មកដំឡើងប្រាក់​ខែ ជូន​មន្ត្រី​រាជាការ និង​គ្រូបង្រៀនបានឡើយ តែរក​សំរាប់​ក្រុមគ្រួសារ​របស់នាយធ្វើមហាសេដ្ឋី​តពូជបាន.. 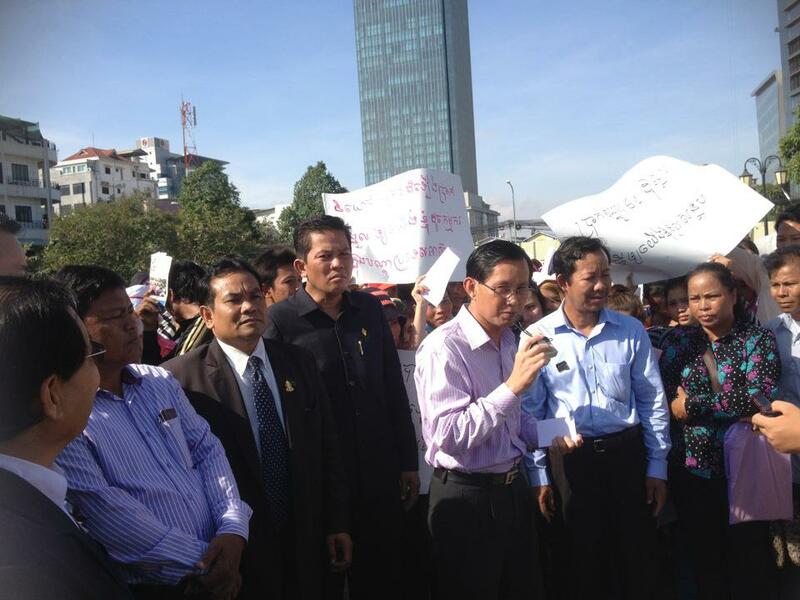 The opposition Sam Rainsy Party MPs joined the workers today (31/12/12) in protesting to demand a minimum wage increase from $61 to $150 per month. 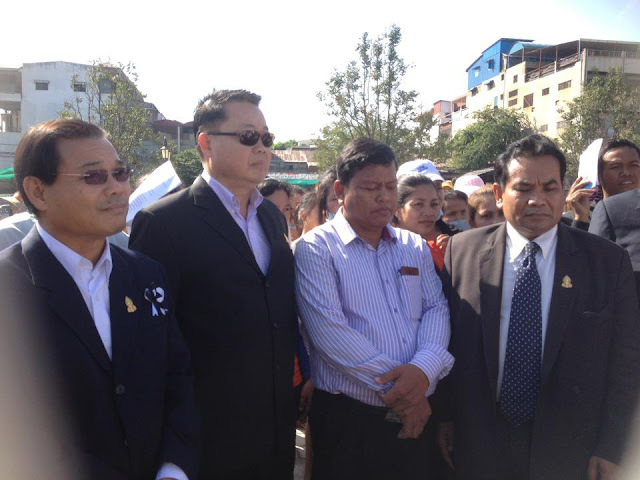 Ly Yong Phat (holding the sugar) and Hun Sen (to his left) during the inauguration of the sugar refinery. Prime Minister Hun Sen encouraged Cambodians to strive for Chinese-style millionaire status as he inaugurated a sugar refinery located inside two controversial plantations belonging to CPP Senator Ly Yong Phat and his wife in Kompong Speu province. “I have one clear policy in strengthening the capacity of local investors, and that is making Cambodians become rich,” Mr. Hun Sen said in a speech at the inauguration on Thursday. “Let’s invest in small and big firms. Let’s make Cambodians become millionaires. Only in Cambodia are there no millionaires. In China there are many millionaires, so don’t think that a communist country has no millionaires,” the prime minister continued, adding that foreign investors should feel they have equal access to entering the market when competing with local enterprises. Mr. Hun Sen said that promoting a wealthy class was the best way to help the poor. “If a country has no millionaires, where can the poor get their money from?” he asked, adding that he would like to see 500 millionaires doing business in the country. One such businessman already doing work in Cambodia is Mr. Yong Phat, who the prime minister praised for employing more than 8,000 people at his new sugar refinery. The prosecutor general of the Appeal Court has appealed against the Svay Rieng Provincial Court’s decision to drop all charges against the former Bavet City governor, the chief suspect in a shooting that left three female garment workers seriously injured. Ouk Savuth, the prosecutor general, said yesterday that his appeal was filed on December 21, three days after the Svay Rieng Provincial Court decided to drop charges against Chhouk Bundith [Bandith], the former governor. Mr. Bundith had previously been charged with “causing unintentional injuries” for his role in the February shooting during a protest outside a shoe factory supplying the German sports brand Puma. “We appealed against the Svay Rieng Provincial Court’s decision after it dropped the charge on the workers’ shooting on December 21, but no reporters asked me about it,” Mr. Savuth said. “We are taking Mr. Bundith’s case for sentencing at our Appeal Court in order to find justice for the three victims,” he added, declining to elaborate further. The provincial court prosecutor, Hing Bunchea, confirmed yesterday that the Appeal Court would take over Mr. Bundith’s case. “Our court clerk will hand over Mr. Bundith’s case to our Appeal Court on January 2,” Mr. Bunchea said. The move from the Appeal Court is not connected to the December 19 appeal from the three victims against the decision by the Svay Rieng Provincial Court, whose handling of the case has incurred criticism from rights groups and international observers. 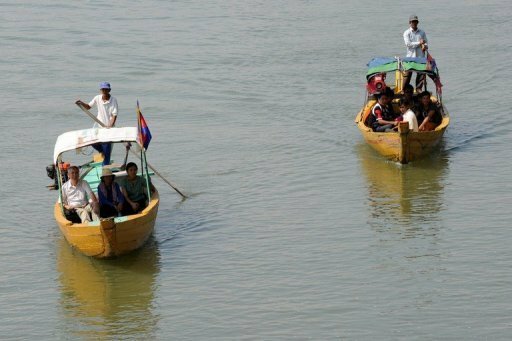 Enlarge PhotoAFP/AFP - This photo taken on December 6, 2012 shows Cambodians and foreign tourists on boats to spot dolphins along the Mekong river. There is a ban on hunting dolphins in the Mekong, but old habits die hard. Some 77 unarmed guards patrol the Cambodian stretch of the Mekong on the lookout for activities that could harm dolphins. But a short distance upstream, river guard Pech Sokhan sighs as he holds up two large, tangled gill nets recently pulled from the murky water -- evidence old habits die hard despite a ban on the practice that ensnares many dolphins. "We have to keep educating people every day," said Pech, one of 77 unarmed guards who patrol the Cambodian stretch of the Mekong river on the lookout for activities that could harm the dolphins. Entanglement in gill nets -- vertical mesh nets left in the water for long periods -- is the main cause of death in adult Mekong dolphins, according to experts, who believe the grey mammals with distinctive blunt beaks are in imminent danger of extinction in the river. Estimates for the number of remaining adult Mekong river freshwater Irrawaddy dolphins range from 85 up to 180. Although there are no comprehensive studies, the International Union for the Conservation of Nature classes the species as critically endangered. The dwindling population faces numerous challenges including unexplained high rates of calf mortality, as well as disease, inbreeding and habitat loss. But "gill nets are the biggest of these threats," said WWF conservationist Gordon Congdon. The fabricated charges used to convict two housing rights activists in Phnom Penh’s Municipal Court confirms the dire state of Cambodia’s justice system and rule of law in the country, Amnesty International says. 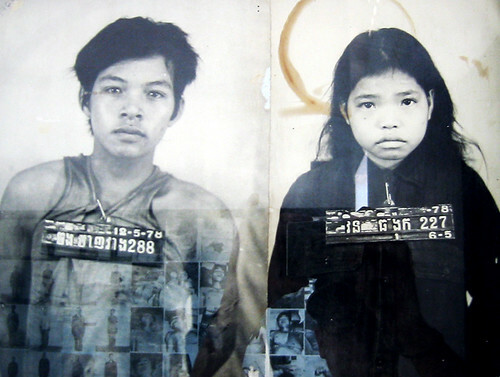 On 27 December 2012 Yorm Bopha was sentenced to three years imprisonment for ‘intentional violence’, while late the previous day Tim Sakmony was found guilty of making a false declaration and given a suspended prison sentence. The charges in both cases are fabricated and no credible evidence was presented at their trials, claims the internationally regarded human rights NGO. 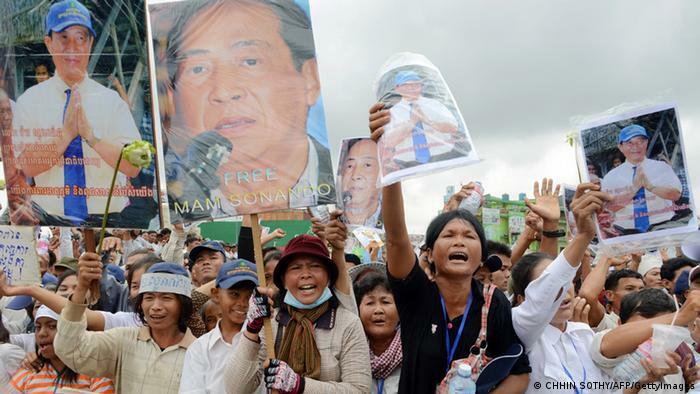 “These shocking verdicts show why Cambodians have good reason not to trust their courts,” commented Rupert Abbott, Amnesty International’s researcher on Cambodia. Yorm Bopha has actively defended the right to housing for her community at Phnom Penh’s former Boeung Kak Lake, where some 20,000 people have been forcibly evicted since 2008. Tim Sakmony protested the violent forced eviction of 300 families in her community in Phnom Penh’s Borei Keila in January 2012 and called for provision of the alternative housing promised to them. 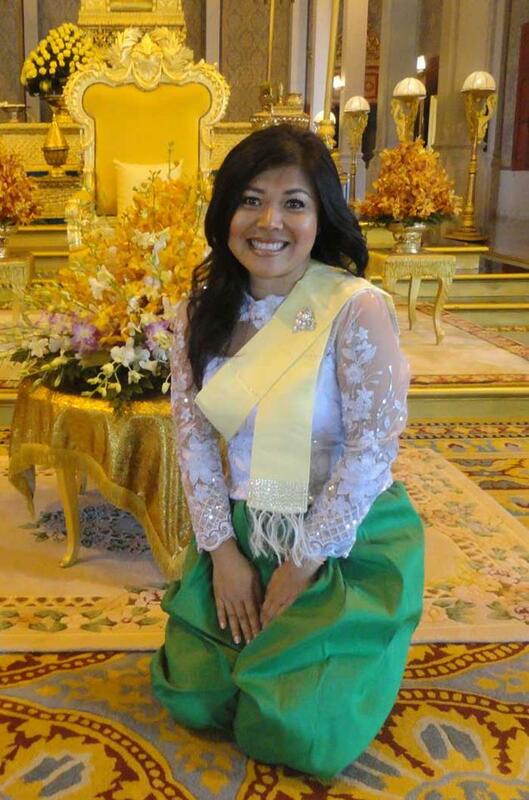 Cambodian justice experienced another setback today when the Appeals Court upheld the 20-year sentences of Born Samnang and Sok Sam Ourn who were convicted for the killing of trade union leader Cha Vichea in 2004 based on forced confessions. “It is baffling how the Appeal Court could have arrived at its verdict in the Chea Vichea case given the lack of any new evidence and the fact that both of the accused have credible alibis,” said Abbott. Cambodian software developers have developed iPphone and iPad games called "Asva The Monkey" . 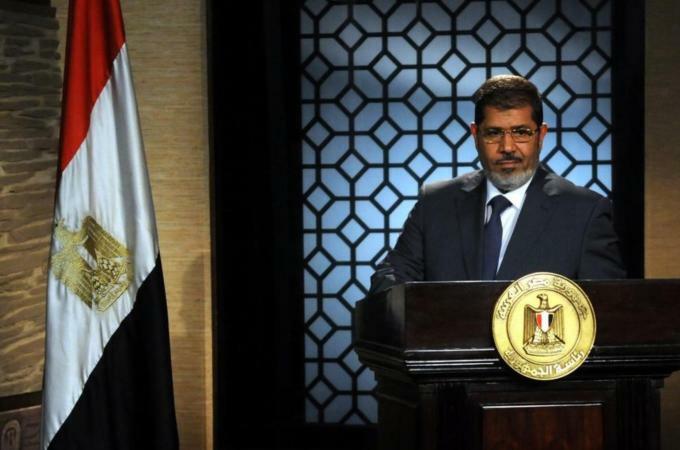 The new Egyptian constitution eliminates omnipotent presidency - the president is allowed only one re-election. Almost invariably Western media have continued to describe the newly adopted Egyptian constitution "controversial". As far as institution-building is concerned, Egypt's fifth constitution is not devoid of positive content in terms of the rights enshrined in the new document. What are some of the key positives in Egypt's new constitution? First, a word is in order on aspects that should be avoided in Libya and Tunisia. Egypt's road to institution-building is illustrative of this most populous Arab state's status as a place of democratic explosion over the past 18 months: two referenda and three multi-stage elections, and Egyptians go to the polls again in February 2013 to elect a new parliament under a new constitution. By any standards, this is a democratic debut unparalleled in neighbouring Arab Spring states - Libya, Tunisia and Yemen. Nearly two-thirds of those who chose to vote endorsed the new constitution. The trend has been there for some time. So far, Islamists seem to be on an upward trend, prevailing in all elections for the lower house (People's Assembly), the lower house (the Shura Council), and two referenda, begun in March 2011 with the mini-constitution adopted temporarily under the backing of the now dissolved Supreme Council of the Armed Forces (SCAF). The figures illustrate the polarisation in Egypt - and this is a common denominator in all Arab Spring societies. Revolutions cannot be expected to deliver harmony from the outset. It is a quality that must be earned through inclusive political processes, which are geared towards bridging all kinds of divides, including respecting some of them, confidence-building measures and broad coalitions. Two years is a footnote in the life of a great nation such as Egypt's in the midst of radical transformation. The cure of time is on the side of Egyptians. Supporters held posters of Mam Sonando outside the court where here sentenced to 20 years jail. Two men once accused of leading a so-called secessionist movement in Kratie province in May, and who later testified in court that popular radio station owner Mam Sonando had encouraged their rebellious actions, received money from the government to build new homes, a district official said. Ma Chhang, 47, and Khat Saroeun, 42, were arrested and put on trial for their alleged roles in leading the so-called secession in Kratie’s Broma village. But both men had their sentences suspended, and were immediately freed from prison, after testifying against Mr. Sonando during their joint trial in October. Even though he was overseas at the time of the alleged events, Mr. Sonando, 72, was jailed for 20 years for what the court said was his “instigation” of the Broma residents. 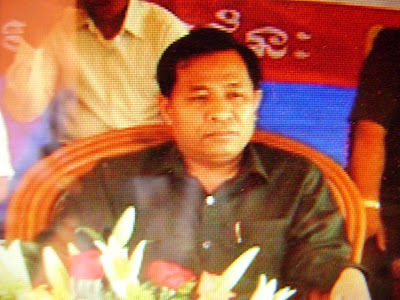 Though Mr. Chhang and Mr. Saroeun were initially named as “anarchy masterminds” by the Ministry of Interior in May, they have since received an undisclosed amount of money from the government, Chhlong district governor Soum Sarith said. “Provincial authorities gave them [Ma Chhang and Khat Saroeun] cash for building proper shelters,” Mr. Sarith said. “Because their homes burned down [after they fled the village in May], we helped support them with cash for building new homes to live in and other materials,” Mr. Sarith said. Chea Mony, younger brother of slain union leader Chea Vichea, announced that he withdrew all criminal complaints against the killers of his brother in order to ask the court to drop all charges against Sok Sam Oeun and Born Samnang who were believed to be scapegoats. Civil society warned of social instability due to judicial injustice, like Yorm Bopha's case and Sok Sam Oeun's and Born Samnang's case. Note: Ou Bunlong, originally from America, was a capable senator and rising star in the Sam Rainsy Party, but defected to Funcinpec in 2003 and now defected to the ruling CPP. Courtesy of http://sokheounpang.wordpress.com/. Vox Populi: Why American investors did not invest in Cambodia? The answer, according to the U.S Ambassador to Cambodia, is because of the lack of respect for human rights and the rule of law in Cambodia. As long as the US markets are still open for Cambodia made products , China is very happy to monopolize the investments and Hun Sen doesn't really care about US investments either for he knows for sure that the US is indirectly helping the PPenh government with MFN ( Most Favored Nations ) status . All products , whether legal or not legal , are ended up in the US consumers' hands, eg. rosewood were illegally sold to Vietnam or China then it is used to make furnitures which are then sold for American living rooms ... Economic sanction is the effective way to teach Cambodian ruler a lesson. 6:08 PM, I agree with you 100%. Many Cambodians, and especially Hun Sen and his supporters, forgot that America is Cambodia's biggest trading partner, importing about $3 billion of Cambodian-made garment, made possible by MFN (most favored nation) status. This status exempts or charges very little import tariff on goods imported from Cambodia. As a result, MFN status has drawn investors to Cambodia, especially Chinese companies, because America has imposed quota on imports from China. So, indirectly, America's MFN has drawn investors to Cambodia anyway, so in Hun Sen's eyes, Cambodia doesn't need to do direct business with America or doesn't need direct American investments because the MFN has drawn investors from other part of the world already, notably China. The only way to soften Hun Sen's dictatorial rule is to imposed travel sanctions on all Hun Sen's family and his cronies like what America did with members of the Burmese junta. That travel sanctions imposed on Burmese officials really worked. What America can do with Hun Sen's and his cronies is to not issue any visas to Hun Sen and his family and cronies found to have been the human rights abusers. America can also freeze their assets deposited in American banks around the world. If America failed to get tough with Hun Sen, he will never understand the diplomatic language and will still continue to practice human rights abuses and corruption in Cambodia. Tough actions, and not words, is the only and best way to deal with Hun Sen.
Agree with you, but we have to be careful with the second Killing Fields coming from the secret Vietnamese agents. We are concerned. As 2012 concludes, we should look back and celebrate the achievements of this remarkable year. Relations between the United States and Cambodia continued to benefit from the dedicated work of government leaders, civil society, and business people on both sides of the Pacific. In particular, as chair of the Association of Southeast Asian Nations (ASEAN), Cambodia took an important step toward realizing its promise of becoming a regional leader. The two visits by Secretary of State Hillary Clinton during the ASEAN Regional Forum and the East Asia Summit, the participation of Secretary of Defense Leon Panetta in the ASEAN Defense Ministers’ Retreat in Siem Reap, and the August visit of U.S. Trade Representative Ron Kirk for the U.S.-ASEAN Business Summit and ASEAN Economic Ministers Meeting all underscored the United States’ commitment to ASEAN and Cambodia’s success. For me personally, the visit of President Barack Obama to Cambodia was the high point of the year, and his participation in the East Asia Summit underscored the importance of our engagement with Asia. A key thread running through these high-level visits was the U.S. focus on strengthening U.S. economic ties in the region. As I have written in this column recently, Cambodia’s growing economy makes the country an important player in this effort, but I have also pointed out that Cambodia’s continued growth and future success depend on advances in the rule of law and protection of human rights. Many of you have asked me how the United States is helping Cambodia in these areas, and one way we are doing so is through our support for the Extraordinary Chambers in the Courts of Cambodia (ECCC), known by most of you as the Khmer Rouge Tribunal. The United States is committed to helping Cambodia achieve peace and reconciliation after the devastating 1975–1979 rule of the Khmer Rouge regime. Cambodia has made commendable strides in reintegrating former fighters and transforming the country from the horrors of war. Justice for the victims, however, has been difficult to achieve. The ECCC seeks to hold the senior leaders of the Khmer Rouge regime accountable and provide a measure of justice for victims through a partnership between the Royal Government of Cambodia and the United Nations. The Thai government decided to issue work permits to 160,000 illegal Cambodia workers. Bilateral trade volume between Cambodia and Vietnam jumped to $3.3 billion in 2012, a 18 percent rise from $2.8 billion in 2011, according to a report provided by the Association of Vietnam Investment in Cambodia on Saturday. The report also said that Vietnamese investment in Cambodia had reached $2.5 billion in 2012, up 25 percent from $2 billion in 2011, ranking Vietnam as the 5th largest investor in the country. It added that 40.7 percent of Vietnamese investment went to agriculture, especially rubber plantation, 34.2 percent to energy, 10.5 percent to banking and finance, 6 percent to telecoms, 4 percent to aviation and the rest went to mining. The year hasn't been kind to Southeast Asia's environmental defenders. Anti-copper mine protesters in Myanmar have been firebombed and Laotian journalists critical of major hydropower projects were silenced; in Cambodia, two activists, including famed anti-logging campaigner Chut Wutty, have been killed; in the Philippines, the number of land activists alone who were assassinated stands at six. The levels of oppression are consistent with a global increase in the number of assassinations of activists, journalists and community workers who expose the ills of economic development - in 2009, according to research by Global Witness, 56 killings took place across the world; last year, 106 were slain. 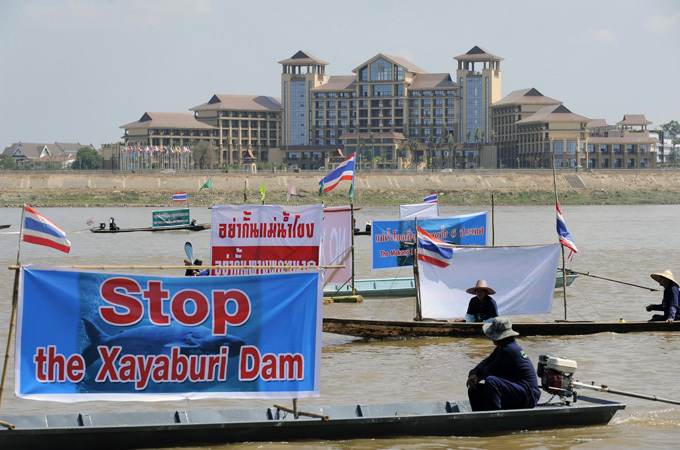 Behind the campaigns to snuff out environmental movements in Southeast Asian countries lurk a murky military-government nexus backed by powerful business forces. The deaths this year in Cambodia and Philippines were "carried out by men in uniforms", said Global Witness in June, who were "acting on behalf of private sector interests and/or governments". Q. What's the first thing you do after stepping off the plane at an airport? A. Wrong answer! No, you don't collect your luggage . . . you join the dance class! Cambodia world expo begins since 1878 building a small part of Angkor Thom in Paris Expo then in 1889 Angkor Wat was built in Paris expo again. In 1906 France received King of Cambodia HM Sisowath and Royal Ballet. French Artist Rodin was in love with Cambodian Royal Dance so he followed and drew a lot of pictures and exposed in his Rodin Museum in Paris today. a classical dance song they sang for a khmer classical dance documentation in the 1960's. PHNOM PENH: Cambodia on Friday gave the green light to construction of its first oil refinery, a multi-billion-dollar Chinese-backed project, as the kingdom looks to tap its untouched offshore reserves. Cambodia's oil and gas regulator approved a deal to allow SINOMACH China Perfect Machinery Industry Corp. and Cambodian Petrochemical Co. jointly invest $2.3 billion in the plant in the southwest of the country. "We hope that we will have an oil refinery plant that can produce five million tonnes of oil products a year," Deputy Prime Minister Sok An said during the signing ceremony. The plant is expected to start operating in late 2015. Cambodia had hoped to begin pumping oil this month from offshore fields, but the start has been delayed indefinitely, according to government officials. The country was feted as Southeast Asia's next petro-state after oil was discovered there in 2005, but production stalled amid apparent wrangling between the government and US energy giant Chevron over revenue sharing. "We have been trying our best to develop the oil sector for years but without results," Sok An said, adding that the government was still in talks with Chevron. Cambodia could be sitting on hundreds of millions of barrels of crude and natural gas, according to some estimates, but it remains unclear how much can actually be recovered. 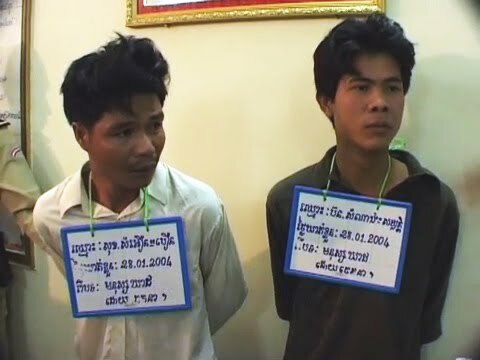 (New York) – Two criminal cases decided in Phnom Penh on December 27, 2012, demonstrate the Cambodian government’s flagrant misuse of the justice system to undermine rights, Human Rights Watch said today. Cambodia’s Court of Appeals upheld 20-year-sentences against Born Samnang and Sok Sam Oeun, convicted after a grossly unfair trial, for the 2004 murder of prominent labor leader Chea Vichea. In the second case, a trial court sentenced land rights activist, Yorm Bopha, 29, to three years in prison, along with members of her family on politically motivated charges for her efforts organizing peaceful protests against land evictions. The government should facilitate a dismissal of the charges against the three defendants and promptly release them, Human Rights Watch said. After the ruling, Born Samnang and Sok Sam Oeun, who had been released from prison in 2009 after an international outcry, were taken into custody to serve the remainder of their sentences at Prey Sar Prison’s Correctional Center 1 in Phnom Penh.